2012 Bowling Green State University Center for Archival Collections' Local History Publication Awards, Academic Scholar Division, Honorable Mention. Toledo's Arab American experience is a great American story of an ethnic community finding fertile soil, sinking roots and flourishing. This has been the story of ethnic groups whose American experience predates that of Arab Americans and it is being written anew by more recent immigrant communities. Thanks to Samir Abu-Absi and the University of Toledo for collecting and publishing this material. It will help to enrich our national self-understanding. "I wanted to help recognize the valuable contributions of Arab Americans in Toledo whose stories of struggle, success and community involvement deserve to be told. These are decent, hard-working, intelligent people who defy the prevalent stereotype." "Samir Abu-Absi's book offers a rejuvenating tonic of thoughtful examinations in a time which could definitely use more positive linkages between the Middle East and the United States. Many of us have long believed a 'world of education' or a 'world of exchange' could be much more useful that a 'world at war' and here's a strong vote in that direction - Abu-Absi promotes meaningful dialogue and inspires discovery in community. We are lucky for this labor of care and hope." "This book brings back wonderful memories of my childhood: the friends, the families, the neighborhood hangouts. It also serves as a record of how a group of proud and hard-working immigrants, some of whom settled in the North End of Toledo over a century ago and others who are relatively new arrivals, have contributed to their community in so many positive and significant ways." "Professor Samir Abu-Absi has performed a labor of love for the Arab Community of Toledo. This collection of essays demonstrates well the 'memories and experiences' of these immigrants from the cradle of civilization, an area now known as the Middle East. The contributors to this collection of essays come from all walks of life and write on diverse subjects concerning the life and livelihood of the Arab-Americans. The essays record a living history of an important segment of this multicultural America." "Arab Americans in Toledo is an important, well-timed contribution to our growing understanding of the numerous, complex ties America has with the Middle East and the Arab world. It is a "must read" for those who wish to understand Toledo as well as one of its most influential populations." 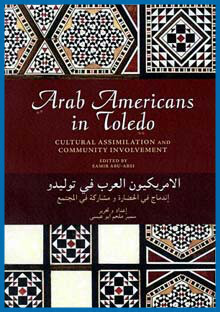 "Dr. Abu-Absi's definitive work about the contributions of Toledo's Arab Americans is a must read." "A delightful work that touches on the many faces of Arab Americans in Toledo which will resonate with the other immigrant groups and their children. The rich contributions of Toledo's Arab Americans are memorialized in this book. It emotes nostalgia for times gone by and the many fine folks with whose paths we have crossed. Everyone can relate to their story." "This book about Arab Americans in Toledo will help you appreciate the cultural richness and tenacity of a people who immigrated to Toledo generations ago and have made it possible for their children and their children's children, to become part of the Great American Dream. For many years, Arab Americans have served in all walks of Toledo life. Their stories are significant and compelling. This book is must reading. It is an important contribution to the written history of Toledo." "Dr. Abu-Absi brings his stellar academic experience and his gentle interpersonal skills to produce a portrait of the Arab Americans of Northwest Ohio. I am sure that his work will serve as an impetus for a national effort in this area and as a resource for academicians, social scientists and story tellers." 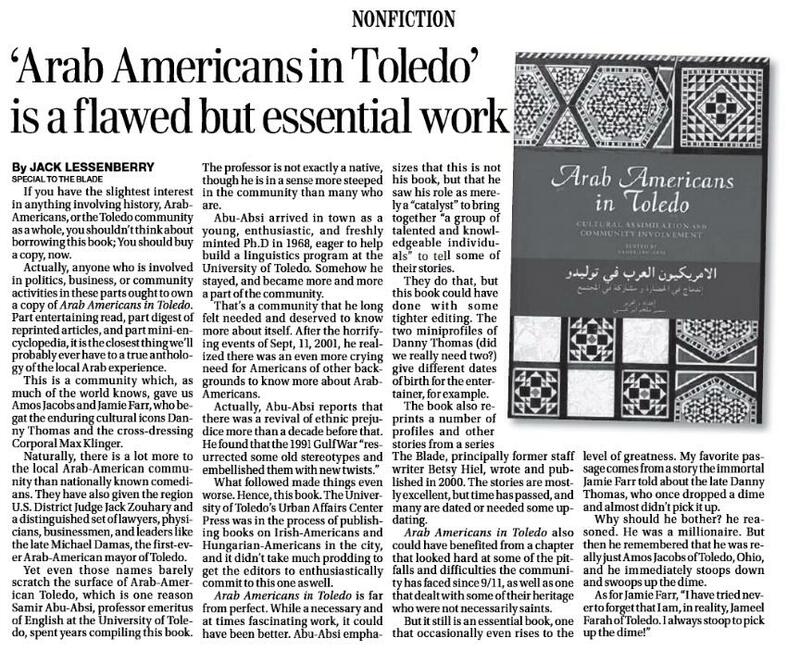 "Review: 'Arab Americans in Toledo' is flawed but essential work"
"[This is] an essential book, one that occasionally even rises to the level of greatness. My favorite passage comes from a story the immortal Jamie Farr told about the late Danny Thomas, who once dropped a dime and almost didn't pick it up. Why should he bother? he reasoned. He was a millionaire. But then he remembered that he was really just Amos Jacobs of Toledo, Ohio, and he immediately stoops down and swoops up the dime." "The Evelyn Shakir Non-Fiction Award"
from the Arab American National Museum. Abu Absi's edited volume has much to offer readers of various levels of interests on the lives of Arabic-speaking immigrants in Toledo, Ohio despite some shortcomings. At first glance the volume seems to embrace assimilation as a goal in itself and references dated assumptions on Arab immigration.The contributors do not make original arguments or explores new trends. Yet Arab Americans in Toledo goes far in addressing gaps in Arab American studies on the immigrants' real-life experiences in specific locations spanning over a century. Moreover, the short narratives and personal accounts by diverse descendants of the city's pioneers, albeit the latter come across as a homogenous lot, successfully incorporate the immigrants' experiences into the cultural mosaic of Toledo. The book contains three sections: Heritage, Profiles, and Interviews. In the first part, the authors denote common cultural and experiential traits at least through the 1960s. They discuss cultural markers in fifteen short articles ranging from Arab cultural identity, the origins of the Arabic language, food, calligraphy, early clubs and associations, and the two major Islamic institutions, the Islamic Center of Greater Toledo and Masjid (Mosque) Saad Foundation. The Profiles section offers new insights on Toledo's established families, Orthodox Christians, and reintroduces the community's celebrated sons, Danny Thomas and Jamie Farr in articles previously published in the Toledo Blade. Not all contributors come from academic backgrounds and Abu-Absi makes no claims that the volume is comprehensive or even a historical study (viii). However, most authors have long-standing ties to the city and the University of Toledo. For example, Dr. Saleh Jabarin, the director of the Polymer Institute authored the chapter on UT's Imam Khattab Endowed Chair in Islamic Studies and Professor Emeritus Amjad Hussain contributed the chapters on Abdul Muneim Muhamoud Khattab. Volunteers conducted many of the eleven interviews in the last section consisting of short personal accounts of indigenous Toledoans and newcomers. These are warm reminder of the immigrants' remarkable work ethic, fascinating personal backgrounds, and ultimately their unmistakable sense of belonging. Hanady M. Awada's summary of her masters thesis in history at The University of Toledo establishes the birth of Toledo's "Little Syria" after Michael H. Nassr arrived in 1881, and reproduces a map borrowed from the Blade showing the residences of Danny Thomas and Jamie Farr (from the TV series, M.A.S.H) and Farr's family-owned market in the city's North End. Hanady's emphasis that hard work by the immigrants inevitably leads to astounding successes comes across as a fortification against discussions of failures and marginalization. Awada often uncritically reminds the reader of the immigrants" desire "to be successful and good American citizens" (19) and "to preserve their ethnic identities, while actively participating in Americanization efforts" (1). Despite giving the impression that Americanization was a prerequisite to success, and the need to distinguish between Americanization and cultural pluralism, newcomers to Arab American studies are made aware of the immigrants' successes in business, participation in both world wars and local politics, Danny Thomas's role in establishing St. Jude Children's Hospital, and the Arab immigrants' enlistment in the Women's Army Corps during World War II. Sketches of religious life shed light on the city's major mosques and Orthodox churches. But here, too, previous studies by Abdo Elkholy are rehashed and leave unexplained the Toledo Muslim's propensity to "assimilate" while maintaining higher religiosity than those in Detroit. (26). The origins and causes of an "influx" of Muslims into the city are not sufficiently explained especially since the dates of their arrival generally contradict prolonged immigration restrictions after WWI. James Adray's chapter on how the Islamic Center of Greater Toledo was conceived, designed, built, and operates, unfolds as an exemplary process due in part to the "ability and latitude" of "Islam in America" to "adopt to the pluralistic world" (77). However uncritical, Adray's contribution is invaluable, given the acute need in the U.S. for even a glimpse at the inner workings of an established and diverse American mosque. In similarly opaque yet sincere approach, Clifford David's "polygonal," though, fond memory of his uncle, Toledo's Orthodox Christian Metropolitan Archbishop Samuel David, glides over "odious" politics of the church and conjures haflis (parties or celebrations) at Buttonwood Park along the Maumee River where 500 Muslims, Copts, and Catholics joined Christian Orthodox parishioners in outings. However, careful and nuanced profiles of the Josephs by Tarek A. Joseph captures the immigrants' extensive travels once on U.S. soil and their arduous journey before claiming membership as Toledoans. Joseph traces the emigration of George Tawil from Kfeir in the Lebanon area of greater Syria through Ellis Island in 1902 after several "scouting" trips, in the process, changing the family name to Joseph in order to preserve the memory of his father, Youssef. Accompanied by his wife and child, George Joseph sought his brother John in Iowa, opened a furniture store in Sioux City a short while later, moved on to Cedar Rapids where he stayed until 1920 before finally moving on to Toledo. Hence, Joseph's account reveals a trail of established communities and, perhaps, sheds light on Toledo's location as a weigh station connecting communities in the western states and the Midwest with the immigrants' trodden path to, and from, New York. A critique of this book should not overlook inherent gaps in the scholarship on Arab Americans. The swelling scholarship, which tips heavily toward gender and post-modern studies, has yet to adequately address the early Arab immigrants' settlement, resistance, and accommodation as part of the massive discourse on ethnic and immigration studies. Tarek A. Joseph's account of how Richard, the youngest of the Josephs, declared "I Am Two People" and that he had "two personalities: one Syrian and one American"; in his speech at Toledo's Woodward High School during WWII, should be juxtaposed with the narratives of cultural pluralism which transformed U.S. society after WWII. I recommend Arab Americans in Toledo. Although predictable and at times uncritical, this is a convincing collection of up-close snapshots of the real lives of Arab Americans in a constant and important weigh-station for Arab immigration over a century.